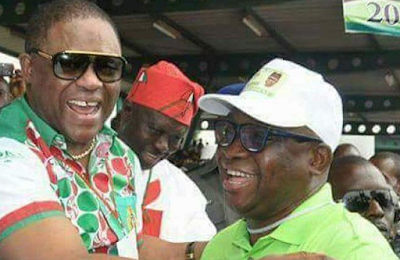 A former Minister of Aviation, Femi Fani-Kayode, has explained why he is backing the presidential bid of the governor of Ekiti State, Ayo Fayose. Mr. Fayose had on Thursday in Abuja formally declared his intention to run for president in 2019 on the ticket of the Peoples Democratic Party, PDP. The governor, who will complete his tenure in 2018, said he joined the race in order to tackle the myriad of problems confronting Nigeria and also engender the unity of the country which he said was being threatened by nepotism, religious bigotry and favoritism of the Muhammadu Buhari administration. In a statement sent to Premium Times on Saturday, Mr. Fani-Kayode, who was one of the prominent members of the PDP that spoke at the event, said he was backing Mr. Fayose because of his courage, frankness and conviction. “I stood with Governor Ayodele Fayose because, unlike most, he has courage,” the former minister said. “He is not bound up in fear and he is not chained down by political correctness. He speaks the raw and bitter truth and he stands up for the weak and the defenceless. He added, “He is a Yoruba man who has the courage and conviction to say that he wants to be president. Why would I not stand with him and attend the launching of his campaign? “I believe that he would make an excellent president and effect the necessary changes and restructuring that our country desperately needs.